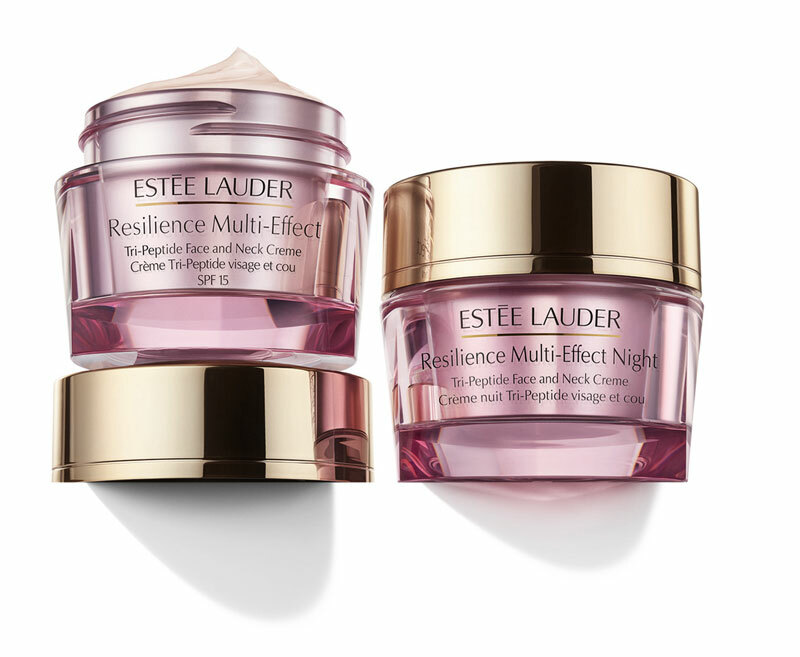 Estée Lauder introduces a powerful multi-effect skincare system for radiant, supple, more resilient skin. New Resilience Multi-Effect collection uses highly effective ingredients that work together to re-energize the appearance of fatigued-looking skin. These moisturizers help counteract the visible impact of hormonal, environmental and chronological changes that can accelerate visible signs of aging in maturing skin. New Resilience Multi-Effect collection delivers multiple benefits by combining three key actions: a fast-acting collagen boost, an innovative multi-defense system and an intensive hydration infusion to renew skin’s glow. To help counteract the loss of support proteins caused by hormonal and chronological factors, New Resilience Multi-Effect collection is powered by a Tri-Peptide Complex—shown by in vitro testing to help significantly amplify collagen by 124% in just 3 days. This advanced blend of three different but complementary peptides is specifically chosen to help skin amplify its natural production of key support proteins. While each peptide targets collagen and fibronectin, in vitro testing shows that these three peptides work together synergistically to amplify collagen and fibronectin production even further. The result is visible: skin begins to look smoother as lines and wrinkles appear significantly reduced. To defend against the visible aging effects that environmental damage can have on maturing skin, new Resilience Multi-Effect collection is designed to help counteract visible skin damage caused by environmental aggressors. Estée Lauder’s first-ever IR-Defense Technology. Featuring Polygonum Extract, from a potent natural herb rich in flavonoids, this technology helps fight “infra-aging”* by neutralizing damage to skin’s moisture barrier caused by exposure to infrared (IR). This also enhances skin’s own natural defense barrier system against environmental assaults. Potent Anti-Oxidants. Resilience Multi-Effect collection delivers protection against pollution, including ozone, and other environmental assaults with a cocktail of potent anti-oxidants including Vitamin E. This helps minimize the visible accumulation of daily free radical damage that can accelerate visible signs of aging – including fine dry lines, dullness, rough texture and loss of firmness. UVA/UVB Defense. SPF protection in the New Resilience Multi-Effect Tri-Peptide Face and Neck Creme SPF 15 completes the multi-defense system by helping defend against damage from UVA and UVB rays, such as the loss of firmness from sun damage that can lead to sagging. *Infrared Spotlight: It has only recently been understood that IR exposure can have a negative effect on skin. Infrared rays, which are mainly emitted by the sun, can weaken skin’s first line of defense against the environment: its moisture barrier. The newest discoveries show that IR ages skin’s youthful look by creating free radicals that can destroy existing collagen and decreases skin’s own ability to replenish it. These effects are especially problematic as collagen production naturally declines in maturing skin. immediately upon application and lasts all day. Infused with skin barrier-building lipids, the ultra-rich formulas strengthen the vital moisture barrier over time, so skin is better able to retain valuable moisture. As skin stays more hydrated, it appears more radiant, seemingly glowing from within.